If you cycle to work or like to go out on your bike at the weekends, the best way to carry all your essentials with you is in a rucksack. They are usually pretty spacious and easy to carry without getting in the way while cycling and they’re generally more convenient than any other type of cycling bag you can get. Depending on how much stuff you need to carry, a cycling backpack can usually hold anywhere between 10 and 20 litres. They’re made from lightweight materials, but of course the bigger the pack the heavier it will be, so only carry what is absolutely essential if you’ve got a long journey. We have included a few slightly larger cycling backpacks for those who really need the extra room. The best thing about a cycling backpack is that it can be simple and stylish for the fashion conscious, or you can opt for something more ergonomic and practical if you’re going to be using it frequently. If it’s the latter you’re after, then looking out for waterproof linings and reflective padding will come in handy for those who use their bike as their main form of transport. If you’re more of a weekend rider, for sport or leisure, then something small and lightweight, with compartments that allow you quick and easy access to your stuff can come in handy. You may wish to opt for a cycling backpack with a bladder compartment for hassle-free hydration, and backpacks with bungee cords to attach other essential items for ease of access. 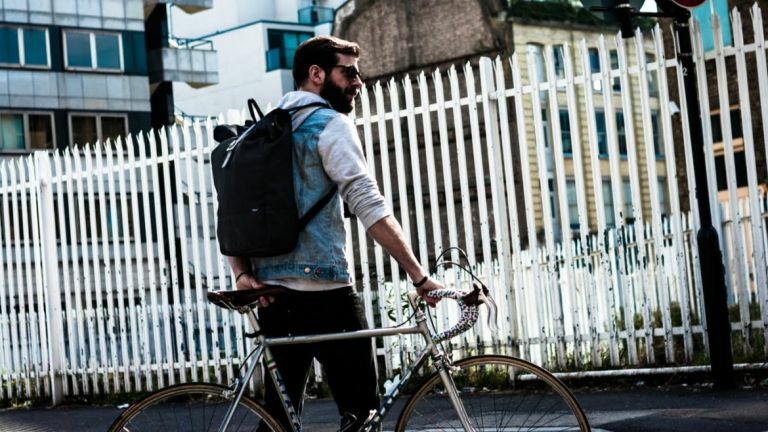 We’ve picked out a range of different cycling backpacks to accommodate all styles and preferences, from city bikers to adventure bikers and everything in between. Check them out below to find the right one for you! This canvas backpack is both a practical and stylish option for anyone who cycles to and from work. The cycling backpack features a padded laptop compartment which can hold any device up to 17” and the roll top closure is expandable for when you have a few extra items to carry. You’ll also have a side pocket which has enough room for a drinks bottle or anything else you want quick and easy access to. As well as being a stylish choice, the pack itself is made from durable waterproof canvas, so you can expect this bag to serve you well even on the rainiest of days. If you cycle long distances or like to go on off-road trails, then this Osprey cycling backpack is designed with comfort in mind. It has a breathable mesh back which is designed to keep you cool even on the warmest of days. The pack is quite large with a padded laptop compartment, but be careful not to overfill as this will make your commute a hard one. This backpack is useful when cycling in all conditions as it has an LED light attachment and a high-visibility rain cover for those wet and windy days. An integrated kickstand keeps the shape of the bag in place so it moves with your body. This smart cycling backpack from the North Face boasts a generous but not overbearing 22 litre capacity with a foam body designed to provide comfort and protection. You can adjust the bags straps and secure them in place with a ladder lock so that the pack moves with your body and stays in place during your cycle. Owners love this bag for its look and build quality, but do not recommend it for tech items as it fills up quickly despite the capacity. Not for commuting with your laptop, but for days out and general use you can expect plenty of room for the essentials. This large city backpack is large enough to accommodate all of your daily essentials for the office, including your laptop, a change of clothing and lunch. Owners say the roll top closer is great for expandability when needed and the padding and back supports mean you rarely feel the difference when adding extra weight as it distributes so well. There aren’t many pockets so sometimes it can be a fumble to find things inside if it’s very full, but it’s waterproof and comes with reflective strips so overall this pack is rated highly for those daily commutes to the office. The Deuter Race X Rucksack is for those who want to keep as much weight off as possible. This is a lightweight and versatile pack, featuring a 12 litre capacity and a ventilated back with mesh shoulder straps which allow your body to breathe when cycling. This backpack also has a bladder compartment to allow you to stay hydrated on the go and there are plenty of compartments and a rain cover so you can stay prepared for all eventualities. You can expect a barely-there feel with this lightweight backpack, and owners find it works well for commuting, fitness riding, every day use and even for running. The ergonomic design with U-frame is designed to make the backpack sit close to your body and those who have tried it say it doesn’t bounce around like other bags do. The height adjustable chest strap means you can ensure it feels comfortable on you before setting off, and the breathable mesh panel means you won’t end up all sweaty when you reach your destination.